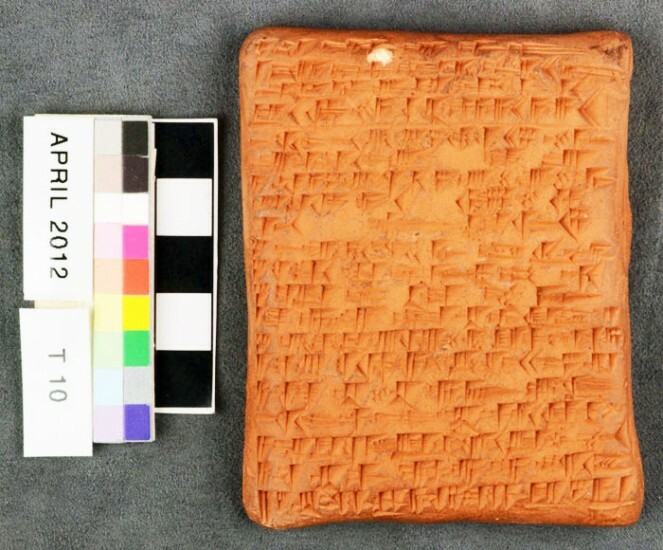 The cuneiform tablet for President Gilman (JHUAM T10). 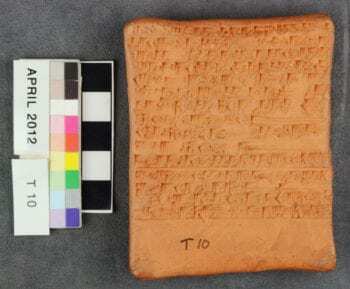 The first four lines of text (above the long horizontal line) begin "To the great chief, Dani'ilu, the son of Gilmanu..."
The tablet was placed on view in the archaeological collection of the Oriental Seminary (as the Johns Hopkins Archaeological Museum was once called) on the third floor of McCoy Hall in downtown Baltimore. The Gilman tablet was later exhibited alongside another tablet, inscribed two years later–also by Paul Haupt–for Classics professor Basil Gildersleeve. The back of the Gilman tablet. The final four lines of text under the horizontal line give the place and date of the inscription. to the great chief, my lord. May He extend thy rule to the end of days! May it be well with thee in the new year! may He establish prosperity in the house of the great school. hath joyfully looked on thy deeds. Thou hast erected a monument above all monuments of the Monumental City. The splendor of thy name is established for ever.